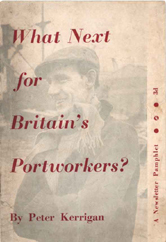 What Next for Britain’s Portworkers? OLDER men on the docks remember the thirties very well. The humiliation of the stands. The 'muscle feeling’. The scramble for a job. They remember the ‘blue eyes’ system—the whisper of ‘You’re staying behind’ into the ear of the favoured ones. The militant was isolated. The man who refused to overload a sling on the last ship was left standing. For the employers those were the good old days. In that peculiar phraseology the employers like to use, they were the days of a ‘better employer-employee relationship’ than has existed since the end of the second world war. They were also days to which the docker is determined never to return. But unless his determination is expressed in organized resistance to the employers plans, the docker will be flung back into the conditions of the hungry thirties. ‘To ensure greater regularity of employment’ is one of the stated aims of the Dock Labour Scheme. Today regularity of employment is the exception for the majority of dockers. The number of men without work is higher than at any time for six years. Already the shortage of work has sharply reduced the living standards of a great number of dockers. Now that overtime is not so readily available the docker-particularly in ports where piece-work earnings are low-is beginning to realize more clearly just how inadequate is his basic pay. At the recent inquiry into dockers’ wages, trade union spokesmen declared that the docker needed 35s. a week to bring his real wages up to what they were at the end of the war. Since that time the cost of living has gone up by 84 per cent., but wages have risen by only 55 per cent. Dockers were given a 7s. 6d. increase after that inquiry— 7s. 4d. after a deduction of twopence which is being put into a fund for purposes yet unspecified. The docker signing on is near the starvation line. Many dockers now live on new housing estates miles away from the dock. Their rents are higher, and fares eat a large Slice out of their fall-back or attendance money. T wo calls a day mean dreary, wasted hours waiting on the dock road, with money spent on snacks and cups of tea. Today a docker with four children who goes home at the end of the week with his basic wage has less in his pocket than he would receive from national assistance. Yet national assistance scales arc based on what are considered to be the absolute minimum nutritional needs. With fewer men in the Scheme, tonnage handled has gone up by 41 per cent, since 1945. The extra productivity, however, has not meant steadily better conditions for the docker. On the contrary, now that the Scheme has produced a ‘surplus’ of labour, the employers are seeking to use it in an attempt to increase their power over the men on the docks and drive all trace of militancy out of dockland. The employers have as one of their aims the break-up of the Dock Labour Scheme. In 1955 they proposed to the Devlin inquiry that the principle of joint control of the Scheme, by employers and unions, should be replaced by control of an organization of representatives of the employers alone’. In the recent Tooley Street ‘black meat’ strike it was only the commendable spirit of the men in the ranks which prevented a break through the scheme. The employers flooded in non-registered labour in an attempt to smash the men’s stand for trade union principle. Trade union officials shamefully gave assistance to the employers when they signed the infamous ‘perishable goods’ agreement. That agreement, if operated would make strikes against even the worst conditions impossible—if dockers were handling cargo that in any way could be termed perishable’— or else it would allow the employer free use of non-registered labour to break the strike. FROM the docker’s point of view there is much that is wrong with the Dock Labour Scheme. In many ways, it gives added power to the trade union bureaucrat and the employer to discipline militancy and enforce onerous conditions such as compulsory overtime. But the employers chafe under it because they have only an indirect control of labour. They want even more power over the docker, so that as profits become harder to get they can squeeze more out of him. They want to be able to hold a knife-point directly at the back of every serious and active trade unionist. One of their demands to the Devlin inquiry was that ‘all those who incite unconstitutional action should be liable to dismissal’. They look upon even the meagre provisions of fall-back and attendance money as a luxury. The more so when their levy is increased as a result of the number of men proving attendance. The big master stevedore or the shipowner will spend more in a round of drinks after a board meeting than a docker receives in fall-back. But dividends and profits are a thousand times more important to him than a pittance for men who move the cargoes. The employers’ plans are clear. Immediately, they want a cut in the register. They want to push the ‘surplus’ into the rapidly growing pool of unemployed. The way they have been using permanent men shows what conditions they want in place of the Scheme. They want a small permanent force, with the rest of the dockers on the Labour Exchange—to be drawn on when it suits them. It was the boast of a Liverpool employer that, given 5000 or 6000 weekly workers and mechanization, he would run the port efficiently. In such circumstances the majority of dockers would be like seagulls grabbing a crumb here and there. Weekly workers, having committed themselves by contract, would be forced to do any type of job for which they were required. And the out-of-work fringe would he a constant threat which the employer would use against the weekly worker. Like others of their class the port employers have been itching for a show-down which would smash organized militancy once and for all. Before the last wage increase was granted they were preparing for a bitter struggle. Some of them were enraged that the Cameron report should award even as little as 7s. 6d. But big business and the Tory government had been given a salutary lesson by the busmen and by the Tooley Street and other London dockers. They had been given a warning about the fighting abilities that can be roused in the working class. So the show-down on the docks did not take place, although it was reported that preparations had reached the stage of the authorities’ taking over Harringay Arena in London as a distribution centre and training certain army units for work on the docks. LET no docker be under any illusion. The show-down which the employers wanted over wages has only been postponed. Their aim is not only to prevent wages rising, but to worsen drastically the conditions of the portworkers in the interests of their profits during a period of slump. To get that desirable state of affairs (desirable for them), they must crush the docker’s spirit. In a recent (October 1958) issue of the Docks and Harbour Magazine—an authoritative journal of shipping and port employers—their aims were set forth in an article called ‘A Remedy for Dock Strikes’. The author called himself ‘Poseidon’. His propositions were: that the employers should cut down on their number; and that the Board should be done away with. The employers are ready for battle. That is the conclusion to be drawn from this article in an authoritative employers’ journal. By beating them down in struggle, by breaking up the Dock Labour Scheme, by creating a pool of dockers on the Labour Exchange hungry for work, by victimizing the militants, the employers hope to destroy the dockers’ fighting spirit and solidarity. They hope to set docker against docker and port against port. They want to return the docker to jungle conditions to the days of dog eat dog, to condition, where men fight each other for work. Portworkers must organize and fight back now. Every militant docker must be seriously concerned with building unity in struggle on every dock and between port.. The only way to defeat an enemy who is preparing and organizing for a show-down is by more powerful preparation and bettor organization. Over half a century ago our forefathers organized in struggle against bestial conditions and inspired the Labour movement in the fight for the dockers’ tanner. Since then the traditions and dignity of dockland have found their highest expression in the way it has rallied to the call ‘an injury to one is an injury to all’. The noted solidarity and fighting capacity of the docker are the guarantee that the employers will not be able to carry out their plans. But that guarantee lies solely in the rank and file. There is no trace of it in the leaders of the Transport and Genera! Workers’ Union, which organizes the majority of British dockers. If the employers offensive has gone as far as it has then the responsibility rests on these leaders’ shoulders. Such advances as were won on the docks during the post-war boom were won by the activity of the rank and file and against the opposition of TGWU officialdom. When, as a result of the strength in the ranks, these leaders were given any concessions in negotiations they almost invariably handed the employers something in return. The most blatant example of this was the agreement which caused the strike of 1951. The union leaders accepted 2s. a day increase, and in return agreed to a worsening of conditions through the introduction of new manning scales as well as measures designed to tighten ‘discipline’. These trade union leaden have not only failed to fight on behalf of their members but have actively helped the employers in the victimization of militants. But for the cowardice and failure of these ‘leaders’, the Dockers’ Charter and much more could have been won during the post-war years when trade was booming. In 1945 the Dockers’ Charter was adopted by a national delegate conference of dockers’ unions, and thus became official policy. It consisted of the following demands: 25s. daily rate; two weeks’ annual holiday with pay; payment for statutory holidays; reduction of hours to forty a week; a retiring allowance for aged and infirm dockers; welfare services in all ports. The leaders of the TGWU not only failed miserably to put up any real fight for the charter but actively opposed the rank and file’s fight for it. ‘Impracticable’ to demand pensions for old dockers! ‘Impracticable’ to demand better welfare facilities! ‘Impracticable’ to demand a living wage and the forty-hour week! That is the type of leadership the dockers have suffered under since the end of the war. To cover up their sell-out on the recent wages demand, the present leaders declared their intention of pressing forward for pensions for old dockers. That was nothing but demagogy. For they refused in the past to back the rank and file in the struggle for pensions at a most favourable time for such a struggle, when trade was at its peak. They viciously attacked militants who were demanding that, instead of reducing the employers levy, the Dock Labour Board use the increased revenue to compensate old dockers who had given their life and strength to the industry. THE way the TGWU officials have treated the ‘blue union’ is further evidence that theft first interest is the defence of their own privileges and power. Disgusted at the failure of TGWU officials to fight for the men they claimed to represent, unable to express their needs through this union’s machinery—With its permanent officers blocking all demands and using their power in the union and on the Board to victimize militants—the northern dockers joined the ‘blue union’. Their right to be members of the union of their choice was in accordance with the principle operated in the past by the Trades Union Congress before the big trade union bureaucracies consolidated their power—that a transfer of union membership should be accepted if it was voluntary. That right was sanctified in the eyes of every serious trade unionist by the fact that men were prepared to make the great sacrifices of a six weeks’ strike to defend it. And, finally, their membership was established in a court of law. But TGWU officials never accepted that the northern men had any rights at all. They have used every method in an attempt to destroy the ‘blue union’—every method, that is, except to build the TGWU as a fighting organization against the employers and a magnet for the docker striving to maintain and better his conditions. They look on the dockers who left the TGWU as ‘their’ property, a source of revenue to be bludgeoned back under their control or to be driven off the dock. At the TUC two years ago, delegates from the National Amalgamated Stevedores and Dockers proposed that the TUC should encourage a united campaign between ‘blue’ and ‘white’ to eliminate non-unionism on the docks. TGWU officials have opposed such a campaign. Discussion on it was shelved at the TUC by a ‘previous question’ motion—a trick performed by a well-known member of the Communist Party. Rather than organize against non-unionism, the TGWU officials have organized to try to deprive ‘blue union’ men of their jobs. If they had put half the energy into a fight against the employers that they use in fighting the ‘blue union’, then dockland today would be a far better place. ‘Please remember this—no docker who is not a member of the TGWU is entitled to anything,’ wrote P. McSorley, a full-time TGWU branch secretary, in the November 1958 issue of Merseyside News, the official organ of the docks section of the TGWU on Merseyside. The biggest crime of those trade union leaders today is that they are trying to split the dockers in face of the employers’ offensive. They are doing it so as to avoid their responsibility to fight unemployment. But those bold words become all the more despicable when we see that these trade union leaders want to evade a struggle against a cut in the register by putting ‘blue union’ men off the dock. ‘If redundancy is to start,’ the editorial ends, ‘it won’t be our members who go first.’ Note the ‘first’! The suspension of the ‘blue union’ from the TUC is meant to help these people to dodge their duty to fight redundancy. In the interests of the TGWU leaders the TUC General Council put demands to the executive of the NASD that it knew -very well could not be carried out. Now it suspends the union from the TUC so that TGWU officials can declare its members to be ‘non-unionists’ and can ask the Board to sack them. This is a betrayal of the interests of all dockers. An unholy alliance of TGWU officials and employers to decide who should be sacked from the dock can end only in the weeding out of all militants, including those in the ‘white’ union. Any retreat in the fight against unemployment will only aid the employers’ offensive. UNITY in dockland to prevent a return to the conditions the employers want to impose is an urgent necessity. But that unity will have to be built in the teeth of opposition and sabotage by TUWU officials. Policies are needed that can unite ‘blue’ and ‘white’ dockers to defeat the employers’ plans. The biggest and most immediate problems arise from the shortage of work. The demand of militants in the industry for many years now has been for an increase in fall-back pay and attendance money, and for one call a day. These demands must be part of a new Dockers’ Charter, one that can unite the rank and file in struggle. The employers want to maintain their profits by passing the burdens of the slump on to the backs of the workers. They must be given warning that a cut in the register will meet with immediate and complete resistance in all ports. ‘White’ and ‘blue’ must fight together against sackings. The forty-hour week is now more ‘practicable’ than ever, with the shortage of work, and so are pensions for the old men, so that they can afford to retire. These demands must find a place again in the charter for portworkers. If the demand for 25s. was justified at the end of the war then—bearing in mind the rise in the cost of living—a demand for 45s. is justified today. Compulsory overtime is an even sharper issue with the shortage of work, as the employers will seek to use the men they hire for any hours they wish, while other men are unemployed. The rank and file of the TGWU and the ‘blue union’ must fight for 100 per cent, trade unionism on the docks, and for the rights of ‘blue union’ members to be in the union of their choice. In 1945 a strong national link-up of dockers in solidarity action won 3s. a day—the highest wage increase since before the war. There is need for the same strong connexions between each port today. There is need for connexions between the ‘blue union’ and rank-and-file committees of the TGWU. This was the pattern of organization which successfully combated the London employers in the compulsory overtime strike of 1954. FINALLY, and above all, the docker must realize that the problems he faces are the same us those faced by the whole working class. The world or dockland is not a world of its own. The employing class is engaged in an offensive all along the line. Defeat or victory for one section of the workers affects every other section. No worker today can afford to be non-political’. Aiding and abetting the employers is the Tory government. And the problems of unemployment, of defending living conditions, lead straight to socialist conclusions—for it is the unplanned system of capitalist production for profit which is responsible for the slump in trade. The docker must play his part in fighting for a socialist society. The nationalization of the port industry should be an aim expressed and fought for by every militant docker. Complete and secure decasualization can come about only in a nationalized port industry which is part of a planned socialist society, with planned international trade. Only then can there be a real Dock Labour Scheme in the interests of he docker and the whole working class, in a Britain where workers will no longer be exploited by shipping monopolies and port employers whose first interest is to maintain and increase their profits.